One of the biggest appeals of ship container homes is the cost. Shipping crate homes can cost up to 50% less than traditional construction, and when building storage container houses the cost of the containers is going to be one of the largest material expenses, if not the largest. 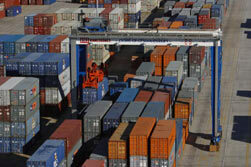 Shipping container cost depends on several variables. Market conditions, location, age of the steel container and its condition are all key. There isn’t a definitive price structure as you would find for retail products at a Target or Sears, but guidelines are available. Your location will be a main factor in estimating shipping container prices. If you live in a rural area far from major train depots, shipping yards and the like, container shipping costs can significantly run up your out of pocket. An option for those not close to transport hubs is to go directly to shipping container companies and arrange transport through them. Shipping container prices are contingent on a number of factors, and with shipping containers prices can vary significantly depending on your location. The best way to make sure you are getting a good price is to study the market, the same as you would if you were going to buy shares in a company you want to own. Before you buy, you watch the market, you look at the options, and in time your confidence grows and you can know you’re getting a fair – or even excellent – deal. Cargo containers for sale come in all conditions, but our focus is on containers fit for use constructing ship container homes. For a 20’ shipping container you can expect to pay around $3,200 new and between $1,400-2,000 used. For a new 40’ shipping container the cost should be around $4,500-$5,000, and for a used 40 ft. shipping container around $1,600-2,700. These estimates do not include container shipping costs. The larger the container, the higher the price and the higher the container shipping costs. When looking at used steel containers, it is helpful to understand the lingo used to describe the container’s condition and back story. Also called one use containers, one trip containers aren’t exactly new but they are fairly close. Typically the container is filled with cargo and used to ship one time, so it is as close to new as you are going to find and the best bet when considering stock for ISO container homes. As far as shipping container costs go, you can expect to pay more for a one trip cargo container than the other classifications. These containers are not in the same kind of condition as a one trip, they may have been used for many years in shipping. While most are structurally sound there will be significantly more wear and tear than with a one trip container. They might be a good option for additional structures if you are looking to keep shipping container costs low, but probably not for a main residential building. Sometimes abbreviated as WWT containers, these containers have been put out to pasture by shipping companies as they are no longer cargo worthy containers. However, they are still perfectly suitable for uses that require protection from elements. While WWT containers probably aren’t the best choice for living quarters, they can be excellent storage options. Wind and water tight containers are also in plentiful supply in most port areas. The name says it all. When a seller lists a shipping container for sale with the tag ‘as is’ look close and hard. Although some as is containers may be in fantastic shape, and many smart sellers will advertise using “as is” to protect themselves from any buyer claims. Even if the container is flawless, you should proceed with caution in this category. 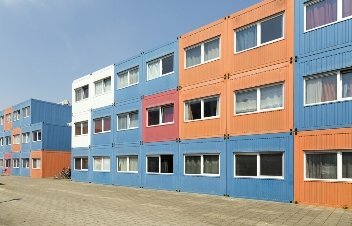 When it comes to shipping container costs, these are at the low end of the spectrum and should be significantly discounted as a function of their wear and tear. As mentioned prior, when putting together shipping crate homes, old shipping containers for sale might not be the best choice. But even old containers could be in pristine condition. In general, however, the older the container, the more likely it has wear and tear. If you are new to shipping crate homes and looking to get your feet wet, a good place to start is with a shipping container shed. When building a shipping container shed, an older container could work very well, and save you some money. If your project is not near a ready supply of shipping containers for sale, container shipping costs will be a major consideration. Moving shipping containers becomes more complicated the more remote the destination. Shipping container transport becomes more expensive the further the destination is from the shipping port or place of sale, so finding the closest steel containers for sale that are appropriate for your needs is important if you want to save on container shipping costs. One of the best ways to estimate shipping costs is to use an online shipping freight calculator. An approximate cost to have a 40’ container trucked from Jacksonville, FL to Atlanta, GA could be around $500. Exact charges will vary from the calculators but the calculators will provide an estimate on which to base budgeting. Used cargo containers can be found all over. Online local papers, train stations and craigslist are good places to start looking for containers nearby. If you are in a port city, they should be much easier to find, and probably cheaper too. 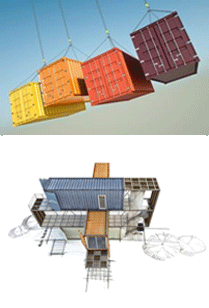 Shipping container costs vary depending on their classification once they are used. Shipping container auctions can be a good way to obtain used containers, but be sure you can inspect the container prior to committing to purchase. Searching the internet will provide you with at least a few companies dedicated to shipping container auctions and general auction sites such as eBay can also yield impressive results, not to mention invaluable market information.